Indian Free Peach – Is this the Purple Peach? This past weekend we attended an event at the Acta Non Verba Urban Farm. Kelly Carlisle, who runs it asked us if we could bring some of our chickens and we happily obliged. There was a woman that taught a cooking demonstration about how to make Sweet Potato Butter that was so very delicious Tom couldn’t stop eating it. Due to Tom constantly being at her table to snag another sample he struck up a conversation with the instructor (I wish I had caught her name). She told Tom about a purple peach she used to get for processing. It was so purple it dyed her hands purple when she processed them. She said it was a peach that was once fairly common in the South but rare elsewhere. According to her there was only two people she knew in the Bay Area that grew it, one in Oakland and one in Vallejo. He quickly ran over to me to tell me about it. He knows me too well. I’m OBSESSED with unique, rare varieties of plants (and breeds of animals). A purple peach? I must find this variety and when I do I will be finding space somewhere in my yard to plant it. Of course Tom doesn’t want me adding more plants so by sharing this with me he was doing himself a disservice. I think he secretly wants one of these peach trees too. I started researching online for purple peach varieties. Here’s what I’ve been able to find. Winegrowers used to plant peach trees with their vines. The peach trees were extra susceptible to mildew so when the trees got infected winegrowers would be able to stop the mildew problem before it effected their vines. These peaches were called “vine peach,” “wine peach,” or “blood peach” because of their red-purple flesh. From what I can deduce, this was primarily done in France though, so not exactly what I’m looking for. Or is it? One “Blood” peach tree was sent Jefferson in 1807 by the Washington nurseryman Thomas Main. In 1810 Jefferson planted forty-one stones of the “black plumb peach of Georgia” in the “New Nursery.” These likely came from William Meriwether, who had passed on “black soft peaches of Georgia” in 1804 and “Georgia black” peaches in 1809. When pomological writers such as Philip Miller, William Coxe, A. J. 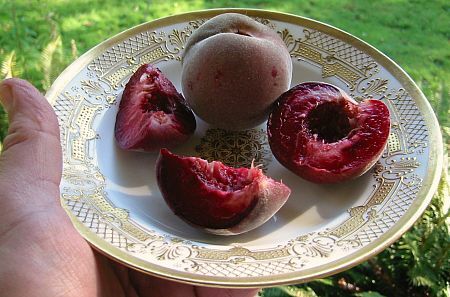 Downing, and U. P. Hedrick discussed the Blood Cling peach, they attributed its origin to a French variety known as Sanguinole, a curiosity suitable mostly for preserving. Today the peach is known as the Indian Blood Cling, a name that unites the “Blood” peach of the French Sanguinole with the “Indian” peach that grows wild in the southeastern states of Georgia and Florida and was obtained by Jefferson as the “black plumb peach of Georgia.” The fruit, entirely splashed and mottled with scarlet, tiger-like stripes, is sometimes twelve inches round. The skin resembles a beet: scarlet, tough, and meaty, although pleasantly flavored and brisk. Blood Cling is a fine peach to eat out of hand but is mostly used for pickling and preserving. It was commonly listed by early nineteenth-century nurseries and is still offered in the trade. There appears to be 4 varieties of peach that might be the purple peach I’m in search of. The Indian Blood Peach, the Indian Free Peach, the Sanguinole Peach, and the Sanguine de Manosque Peach. The funniest thing about all of this is that I have an Indian Blood Peach in my yard already. I originally bought it as an Indian Free Peach but it is not a freestone, but rather a clingstone, so I’m certain it’s actually the Indian Blood Peach. While it wasn’t as dark as the peach above, it was very dark red and it did indeed stain my hands as I ate it. Apparently the color can range from white with red stripes to the dark purple color above from year to year. I’m sure Tom is relieved to know that I won’t be planting another tree in our yard. We have ‘Indian Free’ here, and this year at least it looked more like the other pictures at Tall Clover, where the flesh is streaked purple, rather than solid dark purple. I’m curious why this peach can be so variable (soil, weather etc.). Maybe sometime we should do a taste comparison between your presumed Indian Blood, and our Indian Free. I’m curious to see what the flavor and textural difference is. Ours were really meaty, juicy and tart. Definitely didn’t taste like a peach and it smelled like citrus. I passed one around my office to let my coworkers smell it because it was so unique in fragrance. Also, the skin was a dusty gray with slight pink tint to it. A strange peach indeed! I’m in the bay area and I have two of these trees, not freestone. My neighbor gave me starts in coffee cans 15 years ago or so and he called them Indian Blood Peaches. I frequently have starts in the ground from fallen fruit and have given several away to friends. They are tart but still taste peach-like to me. Pictures of mine here: http://www.cheapcooking.com/blog/2005/09/indian-blood-peach-cobbler.html. Awesome! Yes, they are peach-like but not like any other peach I’ve ever had. Have yours ever come out as dark as the photo above? Wow! They are so beautiful! I’ve been trying to get a cherry tree in our yard for a couple of years (the husband doesn’t want one), but I may be persuaded to go for a purple peach instead! How lovely! How fancy! If there is such a thing as a purple nectarine, I might explode with happy. Time to google…. such deep colour, almost like roselle…..
Would you be willing to sell any of your saplings from this tree or do you have stones to sell? I have been searching for a tree of this color and would like to buy several just to insure sucess in establishment. I have a farm too and we specialize in heritage animals and heirloom plants. Were called ” living legecies heritage farm” in south eastern ohio. So now you see why i am so excited about these peaches. Please contact me at 740-988-6810. again i am super excited about this peach!! Velvie, I don’t have saplings of this and I’ve already pruned it so I don’t have any scions available. The good news, though, is that you can purchase this tree at raintreenursery.com. I’ve seen the picture they have and i am not sure the interior is the same as yours. I am willing to buy stones from you this fall. I will order one from them just to see but there seems to be a lot of variation in the indian peach. I wonder if the natives were breeding for particular characteristics and they varied by tribe maybe. We know they did with corn, squash and grapes. Its the only explanation for the variations i am seeing. They just all became indian blood peaches cause the natives were the ones growing them and they all had at least a tinge of red on the flesh? The peach in the photo is not from my tree (I mention it in the post). I purchased my tree at Raintree Nursery so it wouldn’t be any different than one you would buy there since they are all done by cuttings off of the same tree. The color is not consistent year to year so some years it will be dark and some years it will look like their photo. I have one with deep purple leafs, and fruit, it just sprouted from a normal Peach tree. I’m not sure what state your in but if you want a section from the tree you can have one. By the way I live in the state of Maryland. Does your personal tree actually vary year to year? I have read this but honestly they came across as if they were trying to make over simplistic excuses as to why their peach varied in color from others so i dismissed it. Yes, it varies year to year. Not sure why it does that though. I’m located near San Francisco and would like to purchase a seedling or seeds from a true Indian Blood peach tree since I cannot seem to find one in any of our commercial nurseries. Does anyone have and Indian Blood cling peach seedling they would sell? Thanks very much.